Growing up in a mixed family, I’ve become quite passionate about mixing things up. It started with mixing up languages at a very early age as my parents wanted to raise me bilingual. However, I didn’t really understand the concept of talking French with my dad and Dutch with my mum, so I kind of invented my own language. Call it “Frutch” with even a little Lingala in the mix. Over the years, I eventually started to grow a mutual passion for mixing up styles. I loved plunging into my mother’s bag of African wrappers – also referred to as pagnes – and tops, tucked away in a corner of her wardrobe, serving as a mere souvenir of the bold style she pulled off when she was dating my dad. A little side note: my dad is Congolese, and my mum is Belgian. And for my mum to wear African fabrics back in ’86 is kind of like a big deal for me. It tells me that she didn’t only fell in love with my dad, but the whole package, culture included regardless of the challenges mixed relationships can bring along. Also proving that fabrics aren’t just fabrics, each fabric tells a story, whether it’s a narrative about love, empowerment, solace or pain. Mine would be about identity. In my quest to that identity, my mum’s African fabrics have been served for several purposes. 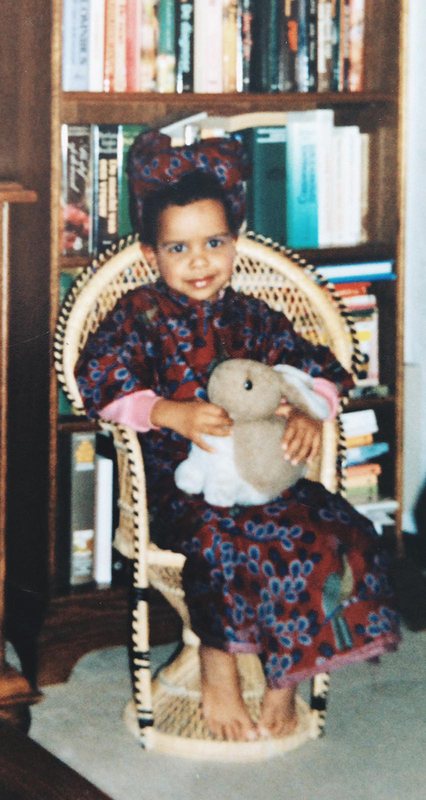 As a preschooler, I’d play dress up to sit on my peacock throne as an African princess. I also loved to wrap my baby doll on my back while pounding some imaginary fufu. As a kid, they served as my luscious long hair during role play with my sister. I had a love-hate-relationship with the kinks in my hair, so when I finished up my homework, I’d escape to this fictional world, where I’d have Pocahontas-like hair, but turquoise with fuchsia flowers in it. A little older, I wanted to become a fashion designer so I organized fashion shows for my grandparents where I would tie up these fabrics into the most creative designs and use my sister as a model. Thank you for that Candice and for always supporting my creative outbursts! Now these fabrics have become a part of my identity. I come home to them as they became a part of my home interior. They define my personality and they flavor op my style in fashion. A style I call point cinque, which is a mix of mostly European brands with lots of African designs. Thus, keeping that jungle fever that hit my parents back in 1986 up by blending and serving cocktails of styles as if I was a mixologist. So please, let me suggest and serve you some of Africa’s greatest and finest designers to spice up your style. Let us exchange narratives and hit you with that jungle fever, having you ask for another round. Cheers!